Blog > General > 8 Latest Long Earring Fashion Trends for Women with Style Tips ! With each passing year, there is varied jewellery on display, showcasing the latest fashion trends for women. This Jewellery is inspired by traditional and nouveau designs that are an art in itself. 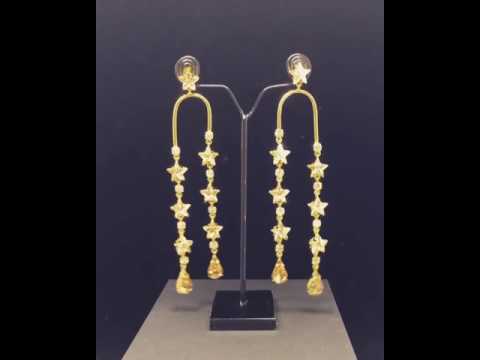 One such jewellery trend that has caught the attention of celebrities worldwide and has already received quite a lot of accolades are the simple yet exquisitely glamorous long earring. Here, in this post, we have covered the top 8 latest Long Earring fashion trends for women that are creating quite a stir in the fashion industry. The One Earring trend is one of the hottest & latest fashion trends for women this season. Be it a simple teeny-tiny stud or the bold shoulder-grazing long earring, this trend of going solo with a single statement earring is a fashion inspiration that will make you look chic in an instant. The glitzy Single Statement Earrings for a trendsetting look by Maithili Kabre! You can also get one Single Earring Look paired with a long necklace with pendant accents! Who says earrings need to be matched at all times? A bold style that exudes confidence, the mix & match long earring trend is another fashion style that continues to be popular, especially, amongst young shoppers. By opting for this style you are creating your own trend-setting look that makes you look effortlessly cool on all occasions. This is exactly how a sassy look can be created! While simple and sleek is a great style, sometimes you need to up the ante with a more eye-catching design and this is where the shimmery crystals long earring comes into play. They are not only striking but also distinctive, which makes them the perfect accessory for any social gathering. Also, this funky yet classy look can go with any casual or western dresses, thus adding a spark in your style & giving you a very trendy look. Hoop earrings are making a comeback! Hoop earrings are casual accessories that have a widespread appeal. They are extremely flexible can be worn at work or at a party and the fact that they are comfortable to wear for long hours makes them a trending and an ideal choice for women of all ages. Wear the Hoops for a many REASONS!! Pixel long earrings are the latest fashion trends for women that are steadily gaining a lot of popularity. They make the wearer look fun & exotic. Plus, their snazzy design catches the eye of all on-lookers, making you stand out in a crowd. A style that is catching up with trends, the ups and downs long earring is an off-kilter style that you should try out. They pair well with both traditional & modern attires and are light-weight with a playful touch that will glam up your look. Lovely long danglers with motifs, crystals and more, nothing says festive more in style than a pair of elegant long earrings. These contemporary designed earrings are a perfect match for all ethnic outfits and symbolise the diversity of the jewellery industry. Get these new go-to accessories for an uptown chic fashion inspiration.They are super edgy, super stylish & extremely covetable. Create an aspirational look for yourself with these beautiful and contemporary fashion jewellery. Floral danglers are a festive delight and you can style them with your best traditional attire! Get a fabulous earring that’ll never go out of style! Wear this handcrafted rhinestones earrings to give your ensemble a touch of glam. How can we miss out on Bollywood when were talking about the latest fashion trends for women. Bollywood style long earring comes in vibrant designs and is a signature collection of stylish accessories for all modern woman. Style yourself like a Bollywood Diva in 2017. Now, that you have a list of the latest Long Earrings, let’s take a look at this simple style guide on how to find and wear these gorgeous masterpieces. Half your battle is won once you find the right pair. While purchasing long earrings it is important to do your research on what is trending and what should be given a miss this season. By doing this you’ll have an upper-hand over your fashion loving buddies and you’ll be the first to wear these latest designs as soon as they hit the market. This is another criteria that you should keep in mind when selecting a long earring for yourself. While it is normal to get carried away by the range of designs that are available, selecting a pair that suits your face shape can help to up your style quotient. For instance, if you have a round face then you need to avoid hoop earrings, as it will only emphasise your round features. Instead, go with a slim long drop earring which will make your face look slimmer. This style tip is an exception and not a rule. However, to get the maximum out of your purchase, pick a long earring that you can team with different outfits. This way you always have something handy to wear for any impromptu party or event, thus ensuring that you are fashion ready for all soirées that you attend. 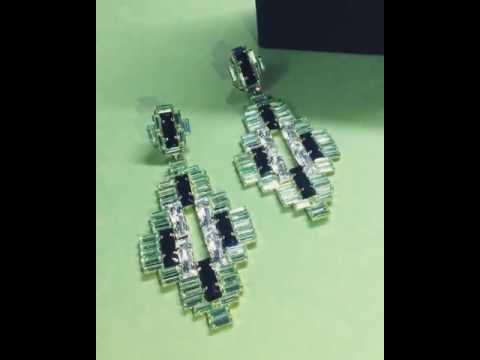 These are, but, just a few of the latest fashion trends for women who love to flaunt new designs in the long earring segment. To make the most of your purchase follow the style guide when buying a designer long earring and then no matter what the seasons are, you’ll always appear stunning. Also, for more fashion inspiration, take a look at our previous blog – Top 10 Jewellery and Accessories Trends For 2016 – 2017 That You Shouldn’t Miss! Take a look & shop for the best Handcrafted earrings by Maithili Kabre.